This guide will show you how to perform the most common tasks in GeneticsLab. Please, select one of the help topics on the list to begin. We hope you enjoy GeneticsLab! 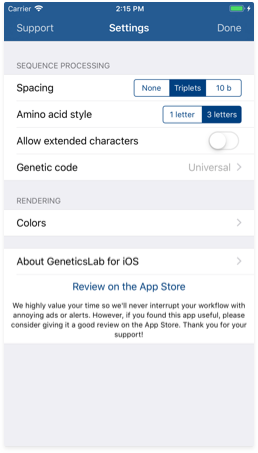 This documentation site will help you get started with the basic GeneticsLab for iOS workflow. Select one of the help topics on the list to display the associated help content. Automatically formats your sequence to display as triplets or another style of your choice. See 'Settings' for more details on this. Invalid characters are colored in red. They are ignored in further processing. You may also see blue-colored characters representing extended symbols. See 'Settings' for more details on this. Updates the base count indicator to show you how many symbols you've already got. Generates the RNA transcription and amino acid translation corresponding to your input sequence. Input sequence field: Here is where you can type or paste your sequence. 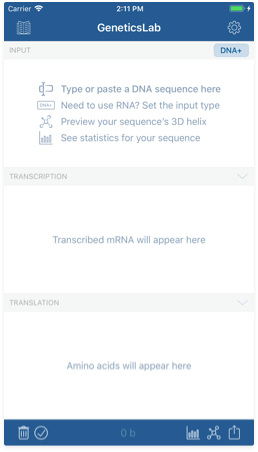 Output RNA sequence field: Transcribed RNA will show up here, according to your input mode. 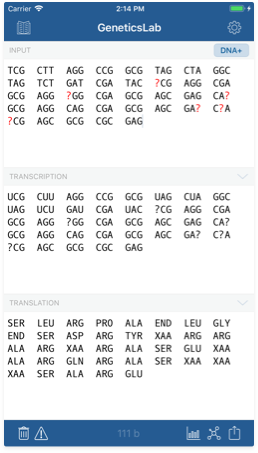 Output amino acid sequence field: Amino acids translated from the output RNA will show up here. Input mode indicator: Its text indicates which input mode is being used to parse your sequence. Tap on it to display a list of possible input modes. Settings button: Tap this button to access app settings screen and customize your experience. 3D model button: This button triggers the creation of a 3D helix model of your sequence. Reference library button: This button displays the reference library. Discard document button: Use this button to clear the contents of the input field. Symbol count indicator: This label will show you how many nucleotides are in your sequence. Statistics button: This button displays the statistics screen. Issues button: This button displays the issues screen. Share button: Use this button to print or share your sequence via mail, social networks or any other apps installed on your iOS device. DNA+: This is the default mode. It assumes your input is the sense DNA string, so output RNA will be generated directly. In this mode, typed U characters are interpreted as T.
DNA-: This mode assumes your input is the complementary DNA string, so output RNA will be generated from a complementary string. In this mode, typed U characters are interpreted as T.
RNA+: This mode assumes your input is the RNA string, so no processing is done here. In this mode, typed T characters are interpreted as U.
RNA-: This mode assumes your input is the complementary RNA string, so output RNA will be generated from a complementary string. 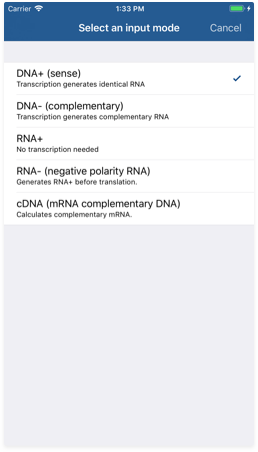 In this mode, typed T characters are interpreted as U.
cDNA: This mode assumes your input is a DNA-complementary version of the mRNA string that will be generated, so it behaves just like the DNA- mode. Invalid input characters. This includes any character not being an A, C, G, T, U or any of the extended genetic code characters if its use is allowed. Ambiguous amino acid generation. This happens when a parsed codon does not have enough information to code for a concrete amino acid. Note that some codons may still translate into an amino acid if their third base is not set to A, C, G or T; since the genetic code actually is degenerated. However, being too unspecific might lead to an ambiguous translation. Unexpected T/U issues depending on the input mode are not generated anymore. They existed on previous GeneticsLab versions but don't make sense since unexpected U characters are automatically transformed to T characters now and vice versa. 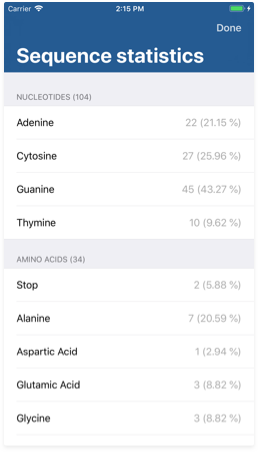 Ambiguous amino acid detection is not available on the current version. Issue fixing is not available on the current version. We're working hard to include this feature in the near future. The sequence statistics screen allows you to get information about the different symbol proportions in your sequence. You may reach the issue inspector by tapping the third button from the bottom right corner on the Workspace view. Each row shows the symbol proportions both in absolute and percentage units. The settings screen allows you to customize the way your input sequences are formatted and processed. You may reach the settings pane by tapping the button on the top right corner in the Workspace view. 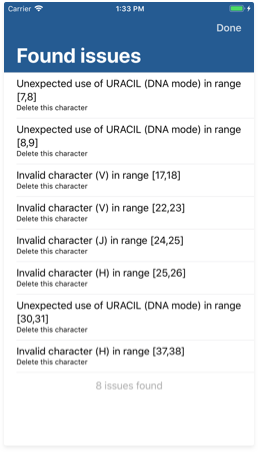 Allow extended characters: You can use this switch to enable or disable parsing of extended character from the genetic code. Yoy may find more information about these characters in the table on this page. When disabled, extended characters are handled as invalid characters. Please note that using these characters incorrectly may lead to ambiguous translation results. 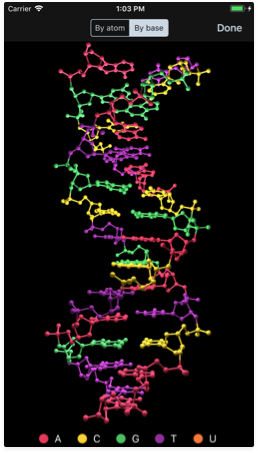 Genetic code: The universal genetic code should be enough for most users. However, if you need to use an alternative genetic code such as the vertebrate mitochondrial code, you may use this control to switch between the different rules. If you're a beginner or you don't remember something about a concrete nucleotide or an amino acid, the reference library might be a quick and useful reference tool. You may launch the reference library by tapping the 'Reference library' button (the 2nd from the bottom left corner) in the 'Workspace' view. A 2D representation of the selected molecule. The full name of this molecule in your language, as so as its standard abbreviated names. The 'More...' button. 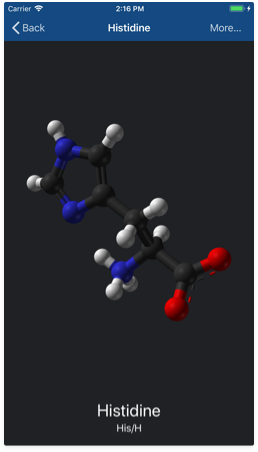 Tap it to check out the article corresponding to the selected molecule in Wikipedia. Learning visually is better and now you can now experiment with a stunning 3D model of your sequence. 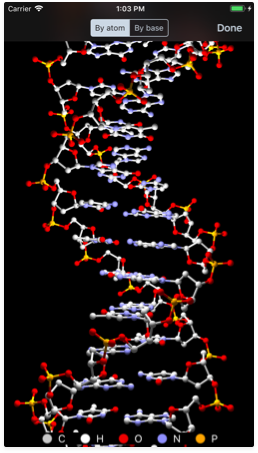 Just tap the molecule button near the bottom right corner and GeneticsLab will generate a 3D representation of the helix structure. This works for both DNA and RNA. Once the helix for your sequence is generated, you'll see how it begins spinning automatically. To stop the animation, just tap anywhere. Pinch to zoom in or out the molecule. Rotate two fingers to rotate the molecule. Slide with one finger to move the camera around the molecule. Slide with two fingers to move the molecule around the screen. By atom: colors each atom according to their element in the periodic table. By base: colors each atom according to the nitrogenous base they belong to. 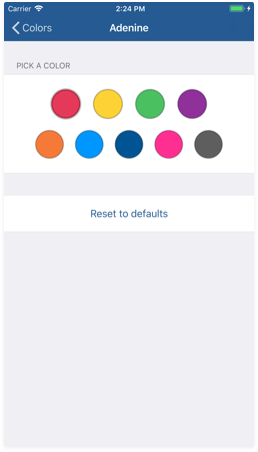 You can customize the default color strategy or even individual colors in the settings screen. See '3D settings' for more details on this. The settings screen allows you to customize the way 3D model generation works. You may reach the settings pane by tapping the button on the top right corner in the Workspace view. Then go to the colors section tapping the 'Colors' button. Default values for the 'By atom' color scheme are the following. For the moment, these cannot be changed in the settings screen. 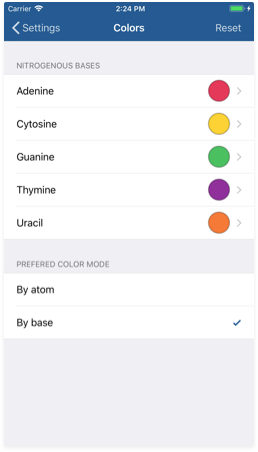 For the 'By base' color scheme, you can change each nitrogenous base's color using the color picker. Customize the colors as you want and then test them using the 3D tool. You can choose the default color scheme for 3D model generation from this section. This will only affect the initial color strategy when you tap the 3D button, you will be able to switch between the two modes at any time. If you have any questions, complaints or suggestions, please do not hesitate to contact me. © 2014-2019 Guillem Servera Negre. All rights reserved. If you have any questions, feedback, bug report or anything you'd like to say, please feel free to get in touch with me at gservera.com.